Acorn pattern, Georg Jensen oyster / appetizer / seafood / hors d’oeuvre forks. 5.70″ long. 8 available. $110 each. Call for volume discount. Check our web pages for more Jensen sterling. Sterling Silver, Georg Jensen, Acorn Pattern Spoons. 6.80″ Long. Single spoons also available. Acorn by Georg Jensen. Sterling silver coffee, demitasse or mocha spoons. 3.75″ long. $95 each. Georg Jensen, Cactus Pattern Sterling Silver Tea Spoon. Danish. 5.33″ Long. 2 Spoons Available @ $90 Each. We Also Have a Set Of 12 Available In Another Listing On Our Web Site. Cactus By Georg Jensen. 12 Tea Spoons. 5 1/3″. Georg Jensen Citrus / Grapefruit Spoons In The Acorn Pattern. Also Usable As Ice Cream Spoons. Made In Denmark 5.75″ length. Georg Jensen, Acorn pattern, sterling silver European size flatware set, Complete for 12 people. Set consists of the following; 12 dinner knives 10″ (stainless blades). 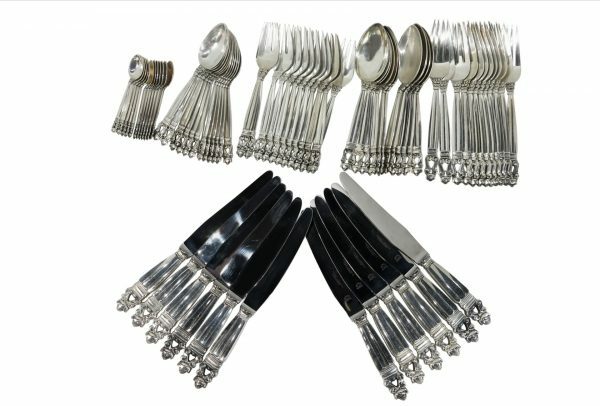 12 dinner forks 7.8″. 12 oval soup spoons 8″. 12 salad forks 7.5″. 12 fish forks 6.6″. 12 oyster / hors d’oeuvres forks 5.7″. 12 pastry / cake forks 5.6″. 12 ice tea spoons 7.2″. 12 butter knives 5.9″. 12 citrus spoons 5.75″. 12 tea / breakfast knives 6.75″ (stainless blades). 12 large tea spoons 6.1″. 12 tea spoons 5.7″. 12 coffee spoons 5″. 12 demitasse spoons 3.75″. 12 compote / fruit spoons 5.25″. 12 fruit forks 5.75″. This is an excellent service, very comprehensive, in the larger sizes and complete for 12. We also have a large selection of serving pieces to compliment this set. Other sets always available, as well as single replacement place pieces and a huge selection of serving pieces. Georg Jensen, Acorn Pattern, Serving Spoon. Sterling Silver. 8″ Long. Just one item from our huge selection of Acorn pattern sterling silver. We have complete sets, partial sets, and single pieces, as well as a variety of serving pieces, current as well as discontinued items. Feel free to call or email us with your requests. Salad Or Serving Spoon & Fork In The Acorn Pattern By Georg Jensen. Sterling Silver. 8″ Long. Just one item from our huge inventory of Jensen Acorn sterling flatware. We have complete sets, single place pieces for replacement and a huge selection of serving pieces. Set Of 12, Acorn Pattern, Place Card Holders, Made By Georg Jensen, Denmark. We have another set of 12 available if you want to make a set for 24. Designed in 1915 by Johan Rohde, the Acorn sterling silverware pattern represents the early foundation of Georg Jensen’s organic and timeless design language. In contrast to the Art Nouveau style of the early 1900s, Acorn’s design captures a classic, understated style where decoration is used to emphasise the form and shape. Regarded as both a sumptuous and noble pattern, Acorn at one time had 220 individual pieces. Today’s range totals 76 pieces and remains one of Georg Jensen’s most exclusive silverware patterns. ACORN by Georg Jensen. Sterling dinner forks 19cm long. 7.5″ approx. 27 forks available, $95.00 each. Call or email for volume discount. We just purchased a HUGE assortment of Acorn flatware. Place & serving pieces. All items are available for inspection at our Manhattan gallery Designed in 1915 by Johan Rohde, the Acorn sterling silverware pattern represents the early foundation of Georg Jensen’s organic and timeless design language. In contrast to the Art Nouveau style of the early 1900s, Acorn’s design captures a classic, understated style where decoration is used to emphasise the form and shape. Regarded as both a sumptuous and noble pattern, Acorn at one time had 220 individual pieces. Today’s range totals 76 pieces and remains one of Georg Jensen’s most exclusive silverware patterns. ACORN by Georg Jensen. 26cm long 10.5″ approx, cake or pie server with the solid silver thick handle Just 1 item from a vast collection of Jensen Acorn we have purchased. Designed in 1915 by Johan Rohde, the Acorn sterling silverware pattern represents the early foundation of Georg Jensen’s organic and timeless design language. In contrast to the Art Nouveau style of the early 1900s, Acorn’s design captures a classic, understated style where decoration is used to emphasise the form and shape. Regarded as both a sumptuous and noble pattern, Acorn at one time had 220 individual pieces. Today’s range totals 76 pieces and remains one of Georg Jensen’s most exclusive silverware patterns. ACORN by Georg Jensen. Large 2 piece carving set. Sterling silver handles with stainless blades. This item is just one of a huge selection of Jensen Acorn currently available at our Manhattan Gallery. Knife is approx 13.5″ long, fork is approx. 12.25″. Great quality & condition Designed in 1915 by Johan Rohde, the Acorn sterling silverware pattern represents the early foundation of Georg Jensen’s organic and timeless design language. In contrast to the Art Nouveau style of the early 1900s, Acorn’s design captures a classic, understated style where decoration is used to emphasise the form and shape. Regarded as both a sumptuous and noble pattern, Acorn at one time had 220 individual pieces. Today’s range totals 76 pieces and remains one of Georg Jensen’s most exclusive silverware patterns. Acorn by Georg Jensen. Carving Set. 2 Piece Carving Set In The Acorn Pattern By Georg Jensen. Sterling Silver Handles With Frank Cobb Stainless Blades. Knife is 12 1/2″ Long. Fork is 10 3/4″ Long. Just one of a huge selection of Georg Jensen that we currently have for sale at our Manhattan gallery. ACORN by Georg Jensen. Marrow or Cheese Scoop, Sterling Silver. 7″ Long , 18cm. 2 available. $170 each. Just one item of a huge selection of Georg Jensen silver available for sale at our Manhattan gallery Designed in 1915 by Johan Rohde, the Acorn sterling silverware pattern represents the early foundation of Georg Jensen’s organic and timeless design language. In contrast to the Art Nouveau style of the early 1900s, Acorn’s design captures a classic, understated style where decoration is used to emphasise the form and shape. Regarded as both a sumptuous and noble pattern. Just one of our huge selection of Georg Jensen silver sets. This set complete for 8 people in the ever popular Acorn pattern. Acorn, By George Jensen, His Most Popular Pattern. Complete Set For 12 People Including Fish Knives & Forks. Dinner Knife Is 9.75″ Long. 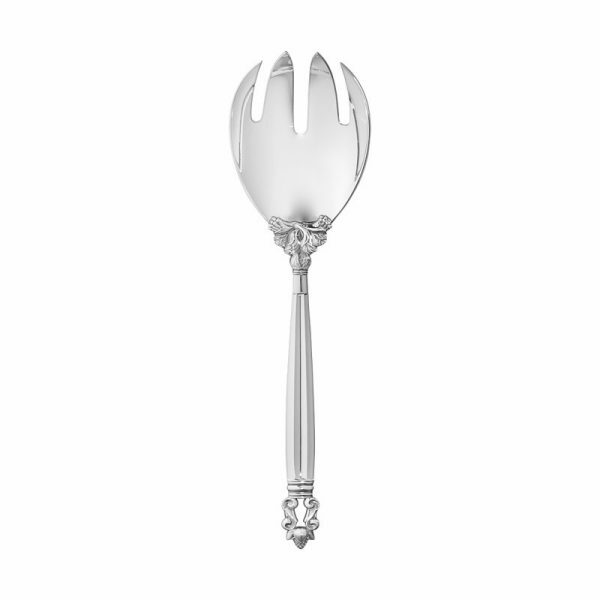 Dinner Fork 7.75″. Large Oval Spoon Is 8″. Unusual To Find In The Larger Sizes, And Also With The Fish Knives & Forks. We Have A Huge Selection Of Serving Pieces. Acorn Pattern, By Georg Jensen. Set Of 12 Lobster Eaters / Lobster Picks. Sterling Silver, Made In Denmark. 7.5″ Long. We also have another 4 available for sale individually, or if you want a st of 16. Please email me for volume discount. Georg Jensen, Sterling Handled Cake Knife. 10.75″ Long. Just one item, of a vast selection of Georg Jensen Acorn flatware that we currently have in our huge inventory of estate & antique silver. Georg Jensen, Acorn pattern, sterling silver butter knife. 6″ long. Solid Silver. We have a huge selection of Georg Jensen silver items, with a large inventory of Acorn pattern. Complete sets, serving pieces, & single, replacement, place pieces. All sizes. Over 1000 pieces of Jensen Acorn flatware always in stock. The Acorn pattern was designed by Johan Rohde in 1915 for Jensen. Before becoming a designer for the studio, Johan Rohde was impressed by the craftsmanship of Georg Jensen. Their first collaboration dates from 1904, when Rohde commissioned Georg Jensen to make some objects for his own personal use. This collaboration was a great success for both sides. Georg Jensen, Acorn pattern, two piece, hand hammered, fish serving set. Fork is 9.75″, knife is 10.5″ long. We have a huge selection of Georg Jensen silver items, with a large inventory of Acorn pattern. Complete sets, serving pieces, & single, replacement, place pieces. All sizes. Over 1000 pieces of Jensen Acorn flatware always in stock. The Acorn pattern was designed by Johan Rohde in 1915 for Jensen. Before becoming a designer for the studio, Johan Rohde was impressed by the craftsmanship of Georg Jensen. Their first collaboration dates from 1904, when Rohde commissioned Georg Jensen to make some objects for his own personal use. This collaboration was a great success for both sides. Georg Jensen, Acorn pattern, large, 2 piece carving set. Knife 13.5″ long, fork 12.5″ long. Sterling handle with stainless blades We have a huge selection of Georg Jensen silver items, with a large inventory of Acorn pattern. Complete sets, serving pieces, & single, replacement, place pieces. All sizes. Over 1000 pieces of Jensen Acorn flatware always in stock. The Acorn pattern was designed by Johan Rohde in 1915 for Jensen. Before becoming a designer for the studio, Johan Rohde was impressed by the craftsmanship of Georg Jensen. Their first collaboration dates from 1904, when Rohde commissioned Georg Jensen to make some objects for his own personal use. This collaboration was a great success for both sides. Georg Jensen, Acorn pattern, sterling silver dinner fork. 7.5″ long. We have a huge selection of Georg Jensen silver items, with a large inventory of Acorn pattern. Complete sets, serving pieces, & single, replacement, place pieces. All sizes. Over 1000 pieces of Jensen Acorn flatware always in stock. The Acorn pattern was designed by Johan Rohde in 1915 for Jensen. Before becoming a designer for the studio, Johan Rohde was impressed by the craftsmanship of Georg Jensen. Their first collaboration dates from 1904, when Rohde commissioned Georg Jensen to make some objects for his own personal use. This collaboration was a great success for both sides. Acorn By Georg Jensen. Sugar Tongs. Sterling Handled Bottle Opener By Georg Jensen In The Acorn Pattern. This Is The Large Size Opener 6.25″ / 16cm Long. We Also Have The 4 1/2″ Bottle Opener Available For $170.00 We Have A Huge Selection Of Acorn Serving Pieces As Well As Place Pieces And Complete Sets For Sale. Ice Tongs By Georg Jensen In The Acorn Pattern. Cheese Plane In The Acorn Pattern By Georg Jensen.